See the world with us! You may recall the New Testament book called Paul’s Epistle to the Ephesians. The Ephesians were the people of an ancient city called Ephesus. Today its ruins have been well excavated though new excavation continues to this day. 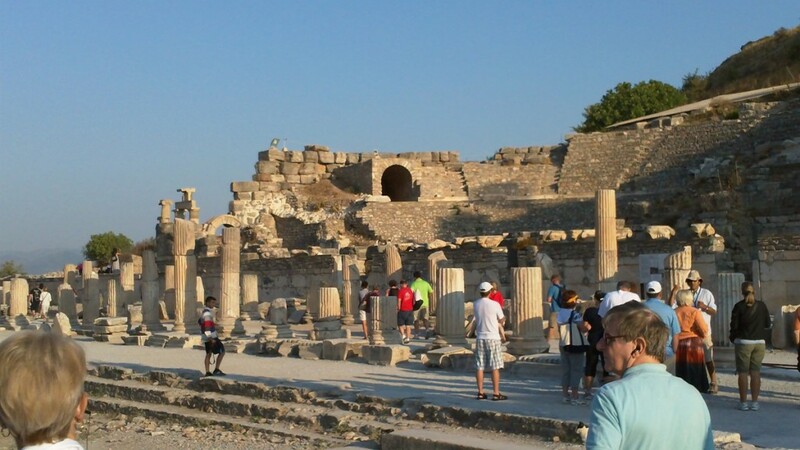 This archaeological site is about twenty kilometres from the Turkish port city of Kusadasi. 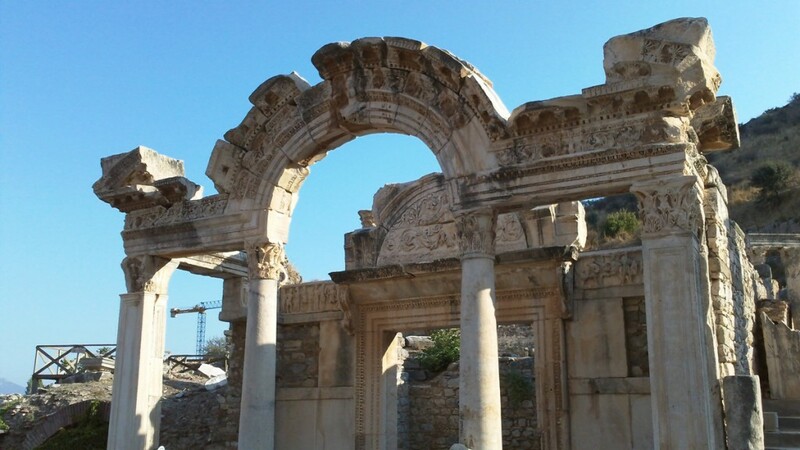 The ancient city of Ephesus lives on through its archaeological ruins. 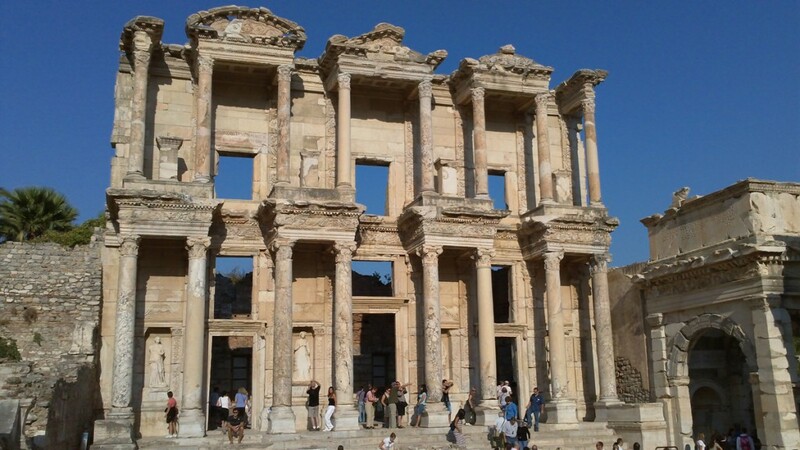 Built in the 10th Century BC, Ephesus was a flourishing Greek city for almost a thousand years. The Temple of Artemis, one of the Seven Wonders of the Ancient World, (around 550 BC) was near here. Little of the temple remains today. In 129 B.C. the city fell into Roman hands. In 88 BC a short-lived revolt brought self-rule to Ephesus but two years later it was back under Roman control. There was also some Egyptian influence in the city. King Ptolemy XII Auletes retired there in 57 BC. And Mark Antony visited there with Cleopatra in 33 BC. Ephesus was made the capital of Proconsular Asia under Caesar Augustus around 27 BC as it entered a new age of prosperity. “It was second in importance and size only to Rome,” notes Wikipedia. In the 50s AD Christianity made a profound influence on the city as the apostle Paul lived there from 52-54 AD. The city is referenced in Paul’s epistle, the Acts of the Apostles and in the Book of Revelations. Sacked by the Goths in 263 AD, the city was rebuilt by Constantine the Great who built the new public baths. It remained the most important city of the Byzantine Empire after Constantine. But the city declined after an earthquake in 614 and conquests by the Arabs and later the Turks. By the 15th Century the city was completely abandoned. Much of the archaeological site is Roman, one of the largest Roman archaeological digs in the world. 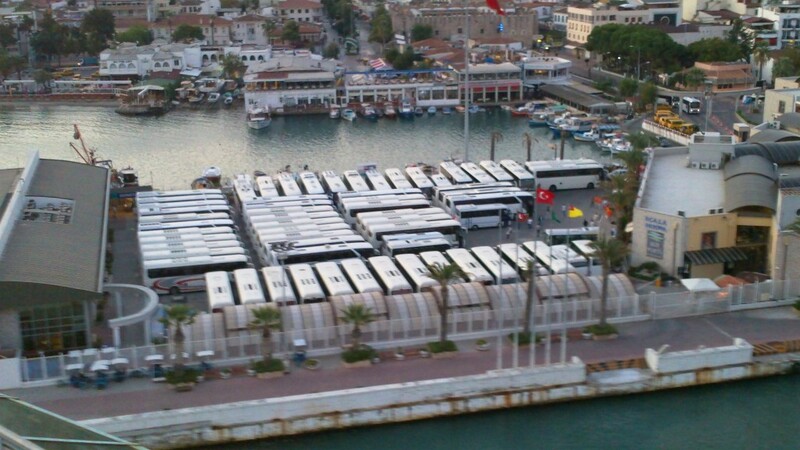 When we arrived in Kusadasi, there were lines of buses to take everyone on their excursions. Most were going to Ephesus. Our guide was a genial fellow who told us a bit about the history of modern Turkey as our bus wended its way on the twenty kilometre trek to the site. About fifty buses were parked cheek by jowl on the pier awaiting tourists. Our guide was very proud of Turkey. He explained that Turkey does not have many of the troubles so common in other areas of the middle east. 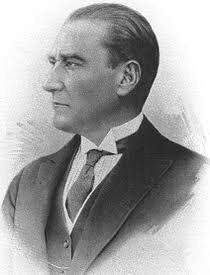 The reason, he explained, was because the father of modern Turkey, Kemal Ataturk, set out to recreate Turkey as a secular state, a modern, western state. He served as the first President from 1923 until his death in 1938. His reforms included recognizing the equal civil and political rights of women, taking them out from under the yoke of Islam. He abolished the caliphate and sharia courts. He reformed education introducing mandatory secular schooling. He encouraged Turks to adopt western style clothing. Turkey remains a democratic, westernized country though its majority religion remains Islam. Wikipedia notes that according to a Gallup poll on Religiousity, 73 percent of of Turkey’s Islam adherents are “irreligious Muslims” and only 7 to 13 percent think religion should have any influence on the law. Unfortunately, religious fundamentalists and radicals have engaged in the occasional act of terrorism in Turkey trying to swing it to an Islamic state. In any event, our guide was most informative and very proud of Turkey’s secularism and western traditions. He also got off the bus and was our guide through the ruins of Ephesus. Our tour took us down this roadway to the Celsus Library. Along the road to the landmark Celsus Library, we passed a number of other landmarks including the Temple of Hadrian. Hadrian was the Roman Emporer best known for building Hadrian’s Wall in Britain. Another landmark were the baths built by Constantine the Great. 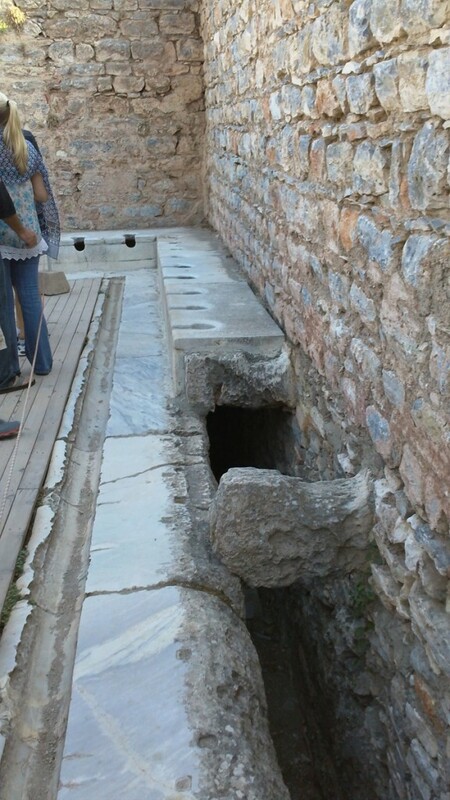 Ephesus was a large and modern city and had running water. The baths were surrounded by public toilets which opened onto a channel of running water to carry the effluent away. Public toilets near the baths. 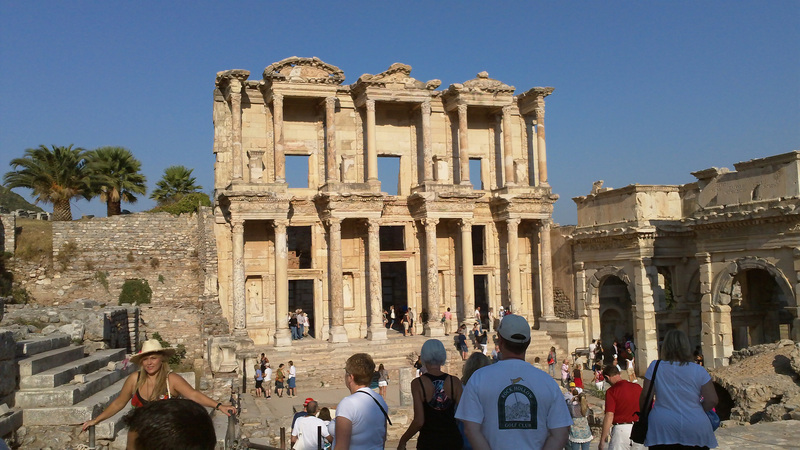 Further along we came to wide plaza in front of the famous Celsus Library. 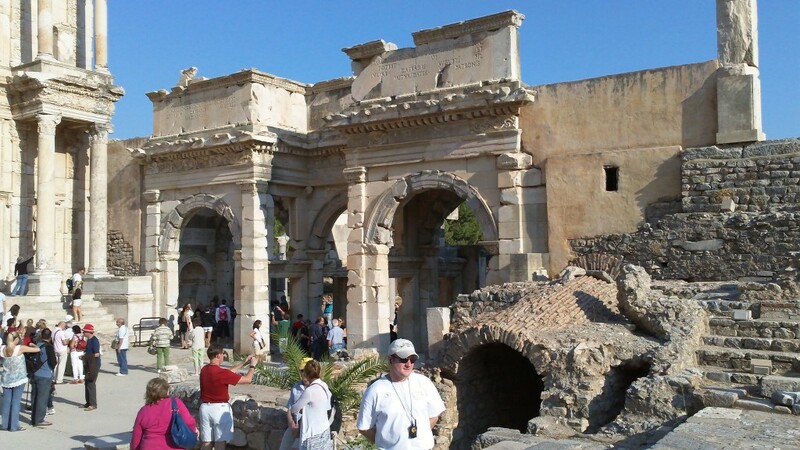 This library was built between 100 and 110 AD for the senator Tiberius Julius Celsus Polemaeanus. Destroyed by an earthquake in 270 AD, some remnants of the facade remained and it was rebuilt between 1970 and 1978. Our guide delighted in telling us that the city’s brothel was located near the library and many a Roman would tell his wife he was going to the library when he was really pursuing less intellectual endeavours. 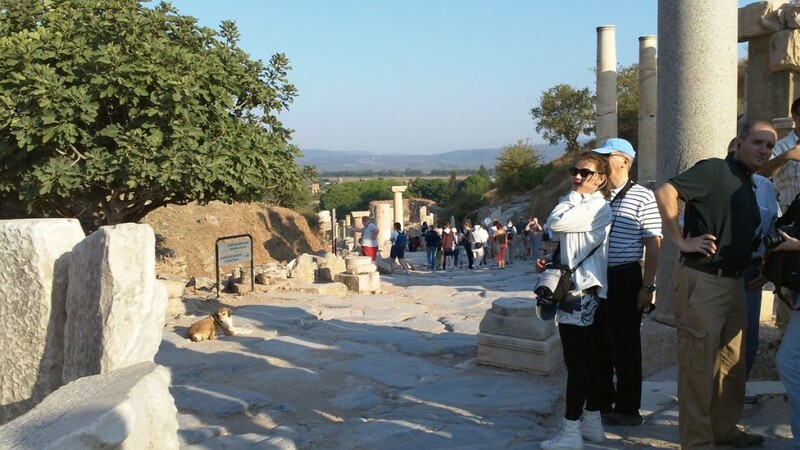 We passed through the Gate of Augustus beside the library and emerged onto a wide thoroughfare where we watched a recreation of the visit of Antony and Cleopatra to Ephesus in 33 BC. 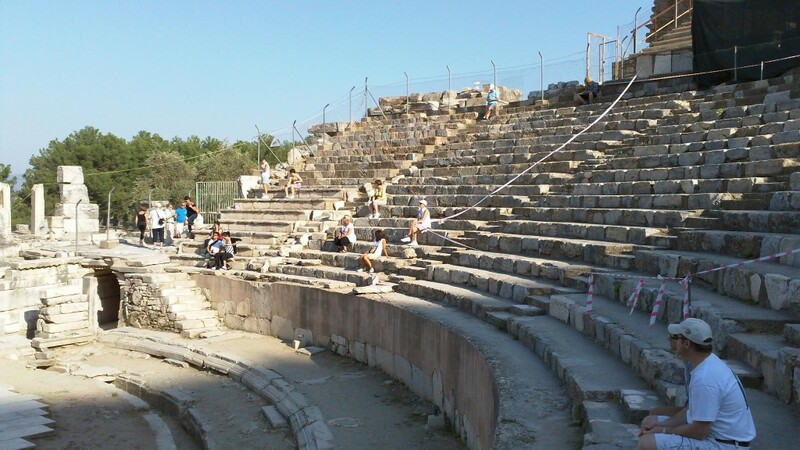 Here we also came to a large amphitheatre. Modern day concerts are sometimes hosted in the amphitheatre. 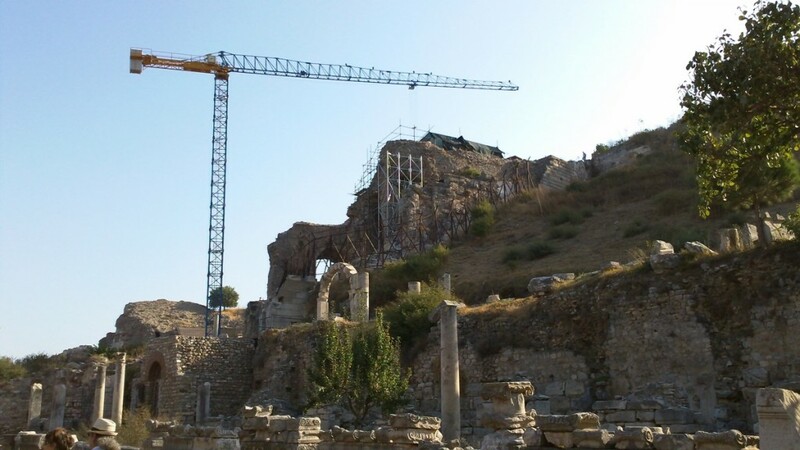 Ephesus is an ongoing archaeological dig and there was a huge crane near the amphitheatre when we were there, part of a continuing excavation project. Soon we were finished our tour and arrived at a market where you could get camel rides and souvenirs. 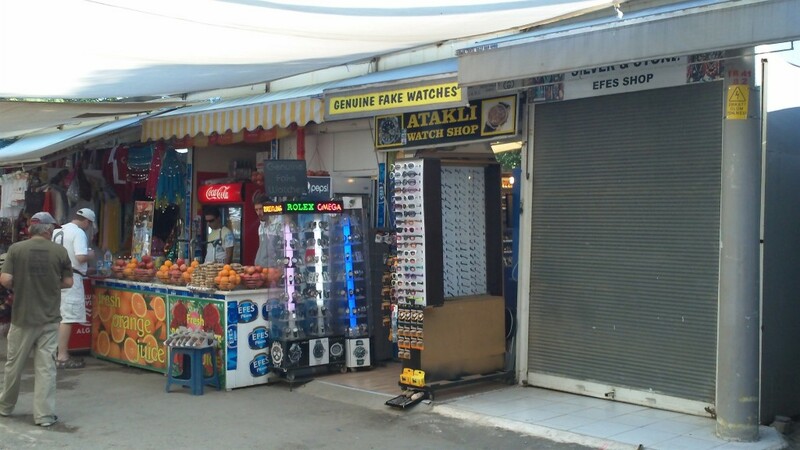 We laughed when we saw a shop labeled Genuine Fake Watches. But apparently the shop is so renowned it shows up on Google maps of Ephesus. Our bus ride took us back to town where we were taken on a tour of a carpet warehouse. A woman demonstrated the ancient art of carpet weaving on a loom for us. Each row of the carpet is made by tying individual knots, then tamping them down and trimming them with a scissors. The carpet folks brought out many magnificent carpets and spread them out before us, inviting us to touch and examine them. Some were quite pricey, especially the silk carpets. We ended up buying a small 15 inch by 26 inch decorative piece as a wall hanging for $200. The Turks are superb salesmen. After the carpet place we had time to walk around the market stalls near the pier. We didn’t get past the first shop. A fellow standing at the entrance greeted us and invited us to come see his shop. We declined but he went into a spiel about Turkish hospitality and how his feelings would be hurt if we didn’t at least look around. We relented. A cluster of shops borders the cruise ship terminal. He then took us through a maze of aisles and displays to a back room where there was a coffee table and some comfortable sofas. He invited us to sit down and we were brought some wine. Then he talked about his product – leather coats. Now neither of us had a leather coat. We always thought them to be a bit pricey and extravagant. But man, this guy was a smooth talker. He kept bringing out coat after coat, asking me if I didn’t think my wife would look lovely in this coat or that? Didn’t she deserve the best? And so on. He finally brought one my wife rather liked. One down, he then said I also deserved a fine coat. Well I did and he found one I liked. We then dickered on price. He gave us a price. We countered with a lowball offer. He countered. We negotiated and finally came up with an agreement. And we went back two leather coats richer and around $600-$700 poorer. Benny’s Shop if you’re looking for a nice leather coat while in Kusadasi. We still have those coats and still use them today, six years later. 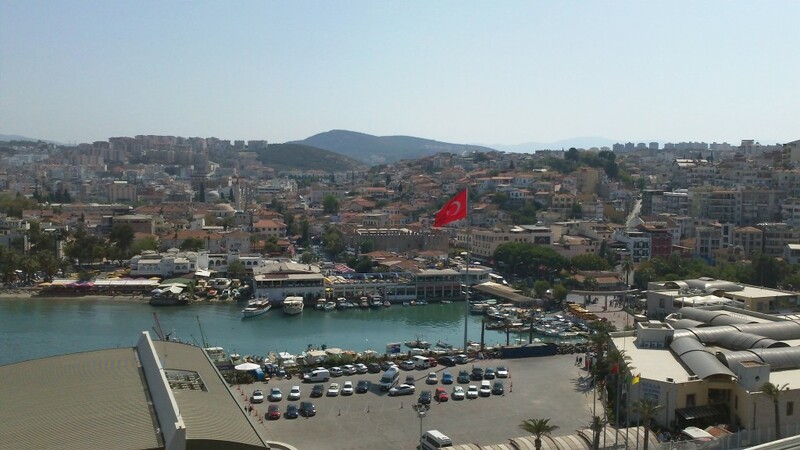 We spent more money in Turkey than any other port we ever visited but consider it money well spent. 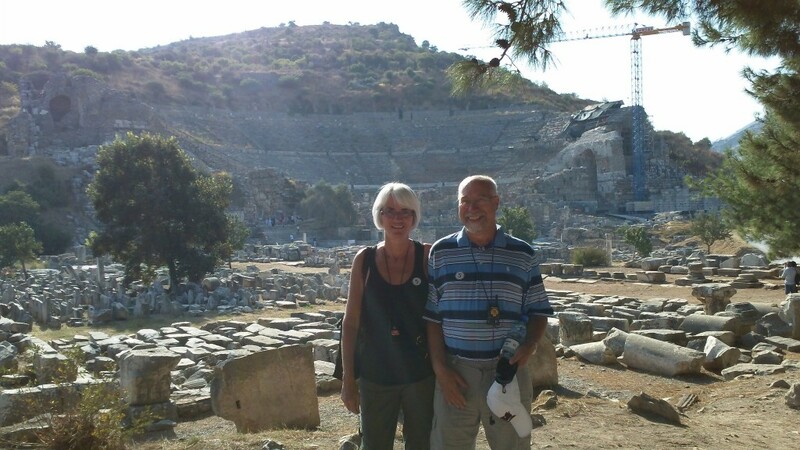 We very much enjoyed our visit to Turkey and to Ephesus. The Turks are a friendly people and the country is beautiful. The ruins at Ephesus were amazing. I’ve added two photo galleries of additional pictures linked below. If you are on the front page, just scroll on down. If you are not, just click on the links.